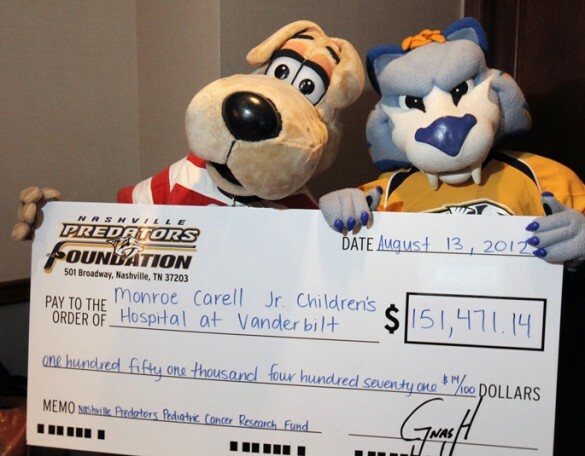 The Nashville Predators organization presented more than $151,000 to the Monroe Carell Jr. Children’s Hospital at Vanderbilt recently to fund cutting-edge cancer research. The newest gift supports an endowed fund established by the Predators, which helps researchers at Children’s Hospital study the molecular basis of childhood cancer and develop novel treatment approaches to improve outcomes for children. A portion of this year’s donation will support the research of Emmanuel Volanakis, M.D., assistant professor of Pediatrics in the Division of Pediatric Hematology and Oncology, who is working on a specific subtype of acute leukemia that presents treatment challenges. The Predators organization has given more than $500,000 in cash donations to the hospital over the past four years. “We are extremely grateful to receive another generous donation from the Nashville Predators,” said Luke Gregory, chief executive officer of Children’s Hospital. “The funds enable our doctors and researchers to bring the same fight to childhood cancer that the Predators bring to the ice, supporting innovative research to identify cures and new treatments. The recent gift will also support patient-support programs Beads of Courage and Flashes of Hope.